Beaver trap for capture of the protected beaver. The beaver traps are finish mounted and painted. The beaver traps are ready to use. Our beaver traps are already successfully in use for several years. Delivery per shipping or pickup. with an official authorization from the competent authority. Transport boxes for captured beaver. 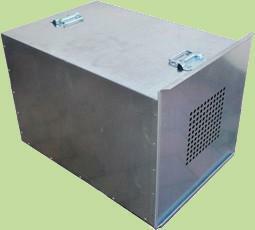 The boxes are made from galvanized sheet steel. Finish mounted and ready to use. the relocation of the strictly protected beavers. The boxes have enough ventilation, so that long transport way isn't problem.